30 Game Scorebook Key points: 10” x 14” in size. Durable ultraviolet ray resistant plastic coil – resilient design to meet the challenge. Track both teams on the same page – no more flipping back and forth thru the book. Custom page layout allows you flexibility for any situation – extra innings, extended Innings, player rotation, etc. The scorebooks back cover is a sturdy hardboard base, so it functions like a clipboard giving you writing surface support. 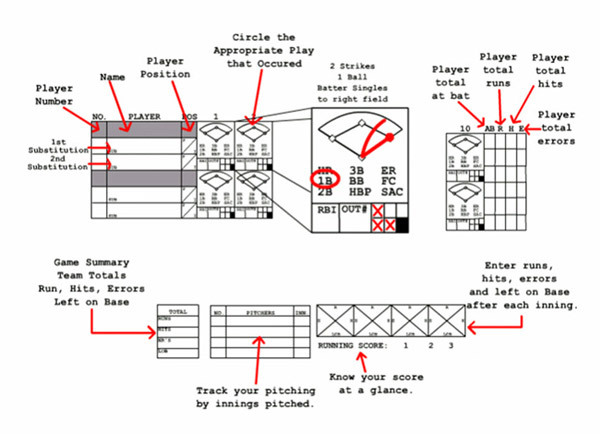 User friendly – even a novice scorekeeper can immediately use our scorebook – functional instructions included on the front cover. Batting average chart provided on inside cover to quickly compute this popular statistic.